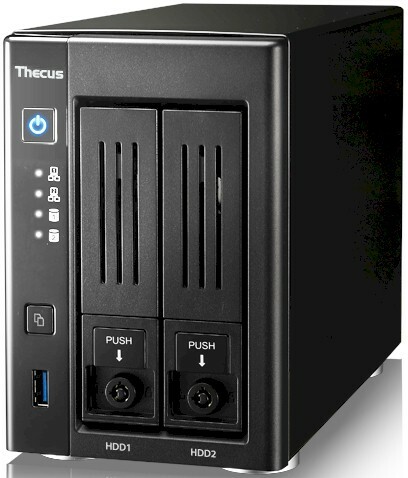 The N2810 is a two-bay NAS recently added to Thecus' SMB product family. Like several other recently reviewed NASes, including the Synology DS216+ and ASUSTOR 6102T, the N2810 is powered by a dual-core Intel N3050 "Braswell" Celeron CPU running at 1.6 GHz. All three products promote 4K Video transcoding as a major new feature - most likely enabled by the N3050 processor. The chart below shows the Thecus' current Linux NAS lineup. While the Thecus site offers product comparison, the N2810 and N2810PLUS are so new that they don't yet appear in the comparison table. The N2810 has its own Quick Installation Guide. The QIG is a short four pages and does not include illustrations for installing disks. There's also a new 164-page user manual, common to the N2810 series and N5810 series, that covers all of the features including those of the new OS7. The image below, taken from the User Manual, shows the front and rear panel callouts. It's nice that the N2810 includes locking disk trays. Not called out on the rear panel, but present at the top of the case is a Kensington security slot for a security cable. The image below shows the main board of the N2810. which appears to be OEM'd from Quanta Storage. The processor is covered with a heatsink. Below the processor is the single SoDIMM slot. To the right of the memory is the connector for the drive backplane. The N2810 drew 12 W with two WD Red 2 TB (WD20EFRX) drives spun up and 9 W with drives spun down. RAID 1 rebuild was immediate when the bad block check was skipped. Noise was rated as low with most of the noise coming from the fan. The N2810 comes with the recently introduced Thecus OS 7.0. OS 7.0 has a lot cleaner and more modern look than Thecus' previous OSes, but doesn't break new ground. Thecus OS 7.0 has features similar to those seen in competing products such as an application (package) store, and a control panel for controlling most features. The image below shows the N2810 desktop. The control panel shown below has five separate categories: Control; Privilege; Storage; Services; and Backup. The image below shows the configuration details for the Services category. Each icon on the main control panel page has a submenu in the settings panel, and each submenu may have multiple tabs. This user interface is fairly intuitive and easy to navigate. Thecus OS7 also provides support for monitoring. In the Control->Monitor menu, there are tabs for monitoring CPU, Memory Hard Disk activity, and Network activity. The image below shows Hard Disk activity. We found iSCSI could not be configured using Firefox 46.0.1 because buttons needed to perform actions were not visible. iSCSI was successfully configured using IE11. Note that Thecus is one of the few NAS vendors that support iSCSI initiator, which is included in the N2810.